ARES commander 2015 has very useful feature Mouse Gestures which is making this software different in 2D category. You can map up to eight commands to mouse gestures from the Mouse Gestures dialog box. It’s very simple to use this: You can use mouse gestures by right-dragging in the graphics area to invoke a pre assigned tools. You will see mouse gesture on screen. You can use a mouse gesture as a shortcut to execute a command quickly, similar to a keyboard shortcut. This increases you working speed. Now notice, one command is in white shade that is in selection, means when you move the mouse over that white area, that command will be executed. You can enable or disable mouse gestures, and set the number of mouse gestures that appear in the mouse gestures. Enable mouse gestures Turns mouse gestures on or off. 4 Gestures With mouse gestures enabled, allows for one gesture command for each direction: Up, down, left, or right. 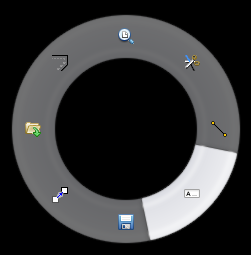 With four mouse gestures, you can assign commands for four directions: Up, down, left, or right. 8 Gestures With mouse gestures enabled, allows for one gesture for each direction: Up, down, left, right, or along one of the four diagonals. Category Filters the command list by category. 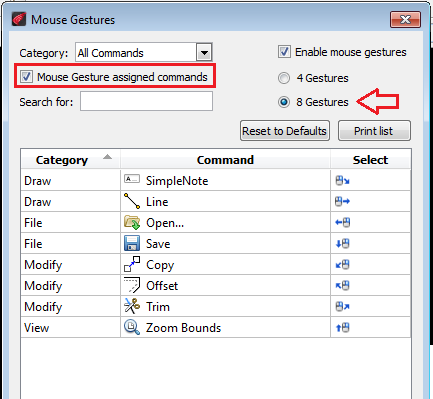 Mouse Gesture assigned commands Displays the assigned commands in the command list. Search for Filters the command list by a search string you enter. Reset to Defaults Resets all mouse gesture settings to the system defaults. 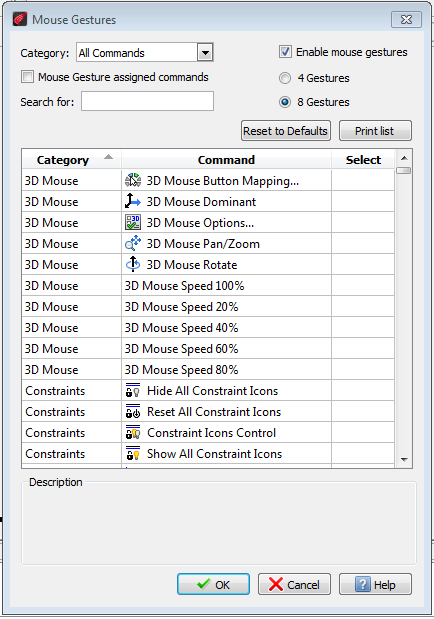 Print List Prints the list of mouse gesture commands. Description Displays a description for the selected command. Category Groups commands into categories. 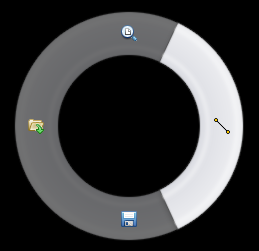 Command Lists commands.A command is mapped to a mouse gesture only if one of the eight mouse gesture icons appears in the command row under the Selectcolumn. 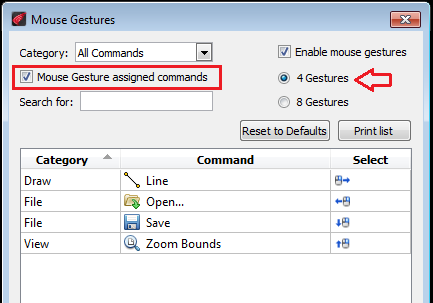 Select Displays four or eight mouse gesture command mappings when you click the column heading. You can click a column to sort by that column. ARES Commander is a product from Graebert GmbH. Graebert GmbH is a leading developer of custom CAD software, solutions and services and has over 30 years of technology expertise… Disclaimer: I work as Specification Writer for Graebert GmbH and occasionally write for CAD -Tips and Tricks. Mr. Amit is working as a Specification Writer in a CAD software development company Graebert GmbH. He is graduate Mechanical Engineer from Delhi College of Engineering, University of Delhi, India followed by double MBA in Operations and International Marketing. He is using CAD software since 1997 and occasionally write for CAD tips and tricks. He is AutoCAD 2013 certified professional. I am working as a Specification Writer in a CAD software development company Graebert GmbH. I am a graduate Mechanical Engineer from Delhi College of Engineering, University of Delhi, India followed by double MBA in Operations and International Marketing. I am using CAD software since 1997. I occasionally write for CAD tips and tricks. I am AutoCAD 2013 certified professional.